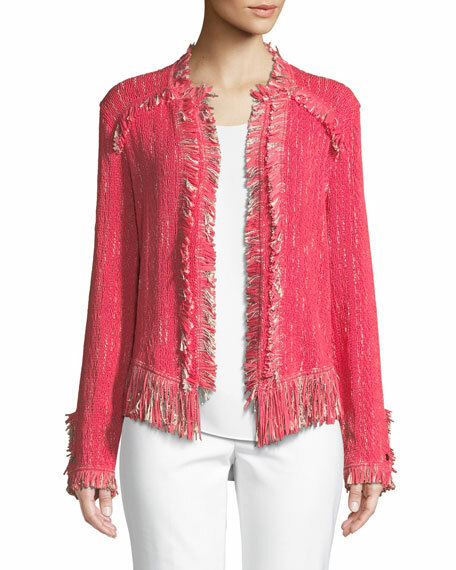 NIC+ZOE "Fancy" jacket in textured knit with fringe trim. Lightweight gauze cardigan in your choice of color. Approx. 27"L down center back. Wrinkle-resistant fabric. Shawl collar; cascading open front. 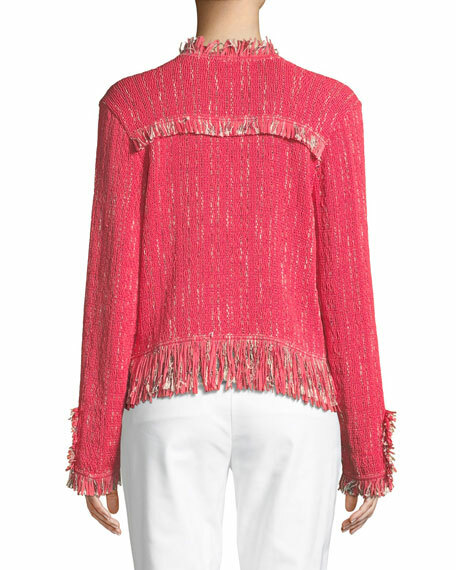 Lightweight gauze cardigan in your choice of color. Approx. 27"L down center back. Wrinkle-resistant fabric. Shawl collar; cascading open front. Loose fit. Hem hits below hip. Polyester/spandex. Dry clean. Made in USA of imported material. Model's measurements: Height 5'10.5"/179cm, bust 32"/82cm, waist 23.5"/60cm, hips 34.5"/88cm, dress size US 2. Eileen Fisher denim jacket. Approx. 19"L down center front, 21"L back. Spread collar; button front. Long sleeves; button cuffs. Chest flap pockets; vertical welt pockets. Cropped at bottom waist. Organic cotton/spandex; machine wash. Made in USA. Eileen Fisher lightweight cotton-blend jacket with ribbon ties. Hooded neckline; ribbon drawstrings; zip front. Long sleeves; contrast trim. Side-entry welt pockets. Grommets with ties at front hem. Relaxed silhouette. Hip length. Straight hem. Organic cotton/nylon. Machine wash. Imported. Eileen Fisher woven sandwash jacket. Drawstring hooded neckline; two-way zip front. Long sleeves; banded cuffs. Relaxed, boxy silhouette. Straight hem. Eileen Fisher woven sandwash jacket. Drawstring hooded neckline; two-way zip front. Long sleeves; banded cuffs. Relaxed, boxy silhouette. Straight hem. Tencel?? lyocell/recycled polyester. Machine wash. Imported.